Bright and colorful dinosaur party squirtie bath toys are fun for kids of all ages. 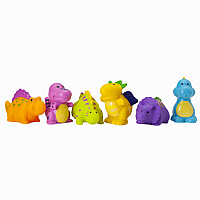 Set of 6 dinosaurs are BPA-free, phthalate-free, lead-free and are painted with non-toxic paints. Packaged in a zippered clear bag for easy storage and gifting. Recommended for ages 6 months and up. Never-ending bath time fun. Give baby the gift that they will love as they grow and have fun at bath time in the tub. 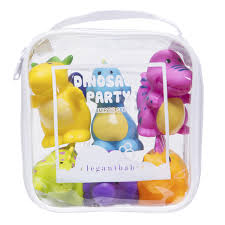 Includes 6 different dinosaur shapes.